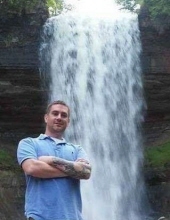 Eric Paul Van Frachen, 33, Green Bay, passed away February 8, 2019. He was born June 9, 1985 to Theresa LeRoy and Jay Van Frachen. Eric graduated from Green Bay West High School. Eric enjoyed the outdoors, fishing, camping. It was the time spent with family, and friends, especially his nieces and nephews that he enjoyed most of all. He is survived by his mother; Theresa LeRoy (Carrie Stoveken), his father; Jay Van Frachen, his siblings; Jennifer Keomanyvong (Thong Keomanyvong), and Robert Younger. His nieces and nephews; Nyah, Anthong, Avin, Tegean, Keon, Kal-el Keomanyvong, and Alex and Logan Younger, as well as aunts, uncles, and cousins. He was preceded in death by his grandparents; Antone and Rose Marie LeRoy, and Elmer and Bernice Van Frachen, Paul “Butch” Van Frachen, and Jimmy Van Frachen. Friends may call at Ryan Funeral Home 305 N. Tenth Street, De Pere after 3:00PM Saturday February 16, 2019. A memorial service for Eric will take place at 6:00PM. Please go to www.ryanfh.com to send online condolences to the family. To send flowers or a remembrance gift to the family of Eric Paul Van Frachen, please visit our Tribute Store. "Email Address" would like to share the life celebration of Eric Paul Van Frachen. Click on the "link" to go to share a favorite memory or leave a condolence message for the family.